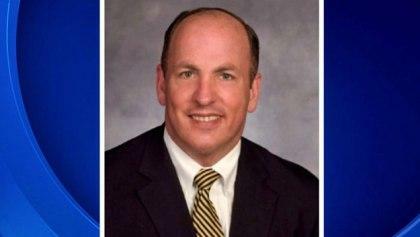 Former Massachusetts state Sen. Brian Joyce, who was facing criminal charges that he used his public office to run a criminal enterprise, has been found dead at his home in a Boston suburb on Thursday afternoon, police said. He was 56. No foul play was suspected, a spokesman for the Bristol County district attorney's office said. CBS Boston reports Joyce, a Democrat who represented the Milton area, was arrested In December 2017, and named in a 113-count indictment charging him with racketeering, extortion, wire fraud and money laundering. Prosecutors said he took up to $1 million in bribes and kickbacks for helping companies, laundering the money through his law office and disguising it as legal fees. Joyce's wife found him dead early Thursday afternoon. An autopsy will be conducted to determine the cause and manner of death. "We believe Mr. Joyce was greedy, plain and simple," FBI Special Agent in Charge Hank Shaw said at the time of the arrest. Joyce was accused of participating in a number of schemes dating back to 2010 that netted him hundreds of thousands of dollars. He allegedly hid the payments by laundering the money through his law office. Prosecutors say he also lied to the state's ethics commission and used the panel as a "cloak of legitimacy for his corrupt schemes." In one case, prosecutors alleged Joyce used his position to exert influence on behalf of a New York-based energy brokerage business and formed a shell company to collect secret kickbacks from the firm. In another scheme, prosecutors say Joyce pressured the Milton Planning Board to approve a waiver sought by a developer, who gave Joyce a Jeep from one of the developer's car dealerships. Joyce pleaded not guilty at his arraignment and was free on $250,000 bond. A trial date had not been set. Joyce's attorney, Howard Cooper, had maintained that his client was innocent of all the charges against him. In February 2016, the FBI and IRS raided Joyce's Canton law office. Months later, Joyce reportedly sold his Milton home and also sold his family burial plot in Milton, where he grew up. WCVB-TV reported that Joyce had been involved in a car crash on Wednesday, but it was unclear if that incident was connected in any way to his death.